CANARY WHARF, England - Aug. 15, 2016 - PRLog -- Canary Wharf, London and Cambridge (UK) based AlgoDynamix have been chosen as European finalists for this year's BBVA Open Talent competition. 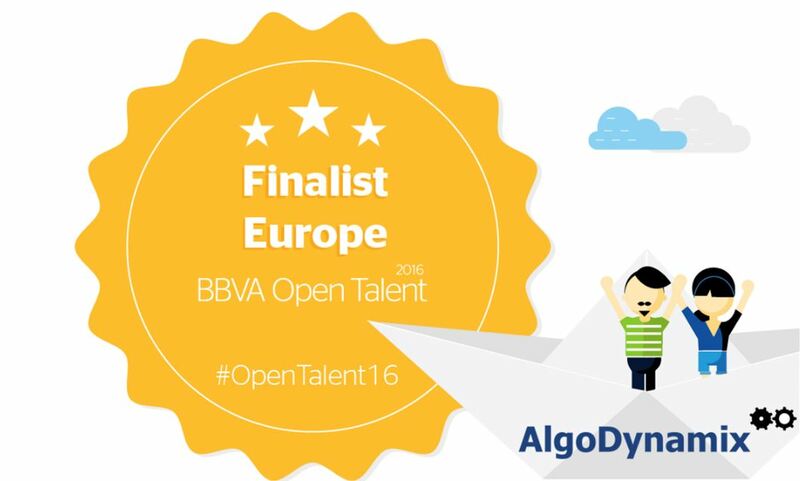 AlgoDynamix are very pleased to announce that they have been selected as finalists in the BBVA Open Talent 2016 competition. The company has a long history of working with corporate and institutional partners including Accenture Fintech Innovation Lab, Dassault Systeme 3DS Fintech Challenge and Accelerate Cambridge, part of the Cambridge Judge Business School. This major achievement is once again a strong validation of how its cutting edge risk analytics technology is having major transformational impact within the rapidly evolving FinTech landscape. The deep data risk analytics provided by AlgoDynamix detect disruptive events in global financial markets and anticipates price movements hours or days in advance of the event. The software is used by investment banks and asset managers including hedge funds and family offices. In addition to their Enterprise Solutions product, the company has also recently launched the compressive 'self service' AlgoDynamix RAP ™ platform (click here (http://www.algodynamix.com/products-2/) to find out more). This zero configuration comprehensive web portal includes real time portfolio monitoring, email alerts push service, a resources/education section and full API connectivity (if required). BBVA continues to seek the most innovative FinTech companies out there covering numerous technologies and applications including Big Data, Analytics, Risk and Wealth Management. Now in its 8th year, the BBVA Open Talent competition has been at the forefront of banking eco system and financial innovation helping companies, such as AlgoDynamix, deploy their unique solutions across the globe. AlgoDynamix had already been working with BBVA executives prior to this competition. AlgoDynamix CEO Jeremy Sosabowski said, "We are very excited to be part of the BBVA Open Talent 2016 competition and are looking forward to a great future with BBVA. The longstanding history of this competition and the comprehensive sources available is a great testimony to BBVA's commitment to great Startups/SMEs such as AlgoDynamix with its unique deep data risk analytics technology"
We now eagerly await the next steps in this global competition. Final results will be announced in September and regular updates will be made available throughout the competition. Please join our mailing list via our official website to receive ongoing information including details of the finals event on 14th September. AlgoDynamix continues to run regular workshops online and at our Level 39 client solution centre in Canary Wharf, London. The next workshop is being held on 9th September and includes a 10 day software evaluation license, registration details can be found here (https://www.eventbrite.co.uk/e/algodynamix-software-works...).